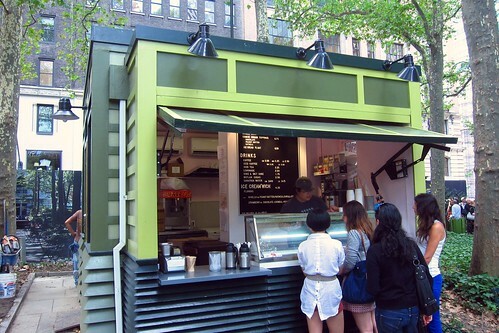 The long-standing ‘wichcraft kiosks in Bryant Park recently got a new outpost, an ice cream kiosk (40th btw 5+6th) close to the carousel. As far as I know, this is actually the first ‘wichcraft foray into ice cream, and they’ve decided to source their ice cream from Van Leeuwen! This actually makes a lot of sense knowing that ‘wichcraft likes to use organic and local products when available. I wasn’t sure what to expect when I headed over to the kiosk, but I ended up finding one of the cheapest ice cream treats around. Single and double scoops are $4 and $7 respectively, with ice cream floats being $6.50. But the best part of the menu is at the bottom. They’ve recreated ‘wichcraft’s Cream’wich as an Ice Cream’wich. The flavors are tricky to understand–you can get vanilla or strawberry ice cream sandwiched between specific cookies in pre-made packages. 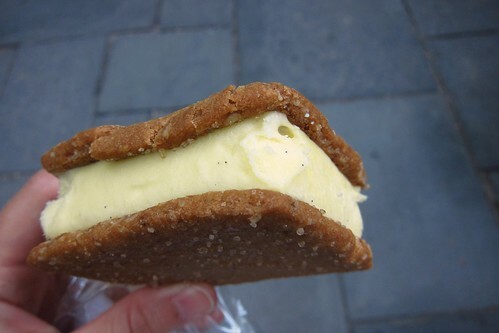 I chose vanilla in between peanut butter cookies since that’s my favorite of the cream’wiches. At $4.25, it’s a perfectly priced lunchtime dessert. Despite coming from a freezer, the cookies were crumbly and had great flavor. I loved the added crunch from the salt on top. Once the ice cream warmed up a bit, it was creamy and delicious. The size is great too–once it starts melting, there are only a few bites left. Posted by Blondie at 9:30 am, August 25th, 2011 under 'wichcraft, Sweets, Van Leeuwen Ice Cream Truck. I saw this kiosk, didn’t know it’s Van Leeuwen. I live near the Van Leeuwen shop off of Smith St. in Brooklyn and I think it is ridiculously overpriced ice cream. It doesn’t taste that good, and it’s expensive as hell. Not a Van Leeuwen fan, whoever is selling it. Can someone please justify the price relative to the mediocre taste? 4.25 for THAT??? I agree with NOLASTEVE–that is a ripoff. That looks miniscule!!!! How would you compare it to Coolhaus? Yeah, I find the VL ice cream tasteless. It’s not worth the calories to me. If I’m going to have an ice cream treat, it has to be worth it. The quality of everything at VL is really high – I get the price – I just don’t dig the taste.